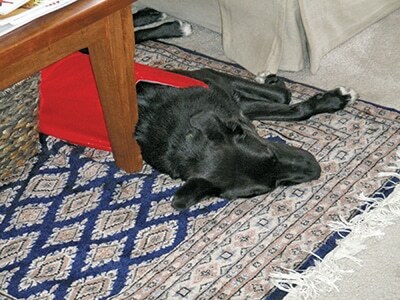 Anxiety and fearful behavior are common in canine patients, and often manifest as storm and noise phobias. Depending on presentation, treatment can be straightforward or complex and challenging. Fear is a normal and adaptive response. In animals, the subjective states of anxiety and fear (see Differentiating Between Anxiety & Fear) are presumed to exist when the pet exhibits behaviors, such as avoidance, whining, crying, trembling, shaking, or panting. The stress response, in the short term, is healthy and necessary. The dog is alert and ready to take action in a given situation, such as retreat from a scary sound. However, when the response is prolonged—for example, fear occurring throughout storm season—physical and emotional pathologic conditions may ensue. How is a normal fear differentiated from a phobia? Experiencing fear when lightning strikes outside is normal, and most people startle or jump in response. This type of response is normal in animals as well. However, if anxiety or fear manifests every time a dark cloud appears in the sky, the leaves rustle, or even at a certain time of the day, these reactions are more indicative of a phobia. Reinforcement (whether intentional or unintentional). Fears and phobias associated with noise can be seen as early as 9 weeks of age,5 but noise phobias usually develop over an extended period of time. The most common examples of noise fear or phobia are thunder and fireworks; an estimated 49% of dogs show a significant fear response to firework noise.6 More subtle examples include noise from dishwashers, ceiling fans, plastic garbage bags, and home alarms. Flooding: Can It Drown Fears? Flooding is the process of deliberately exposing an anxious dog to a “scary” stimulus at maximum intensity until the dog stops reacting in an anxious manner. While the goal may be to habituate the dog to the stimulus and gradually lessen its response through repeated exposure,8 flooding may actually increase anxiety.Once a flooding session starts, it must be continued until the fear response ceases, no matter how long it takes. The dangers involved include the animal directly harming itself, harming the environment, or experiencing a stress response of such intensity that its health is compromised. An end result may be learned helplessness—the dog realizes that there is no escape from the stimulus. When faced with these stimuli, dogs may hide or stay near the owner, tremble and shake, or drool profusely. In worst-case scenarios, panicked dogs may try to “escape” from crates, rooms, houses, and fences, severely injuring themselves as well as causing extensive damage both inside and outside the home. An inciting cause may exist, such as a very severe storm or lightning strike. In patients where an event is not thought to be the cause, identifying another cause is, at best, a guess. This is an area that requires further investigation; for example, do certain dogs have a genetic predisposition to anxiety that increases the chance they will develop a fear or phobia? If possible, having the owner present. Given the complex nature of storm phobia, however, treatment is challenging and requires intensive follow-up in some dogs. The dog may be responding to impossible-to-control stimuli, such as changes in barometric pressure, ionization, and lightning, making desensitization difficult. If the dog responds with fear to the sound of rain or thunder, desensitization and counterconditioning (DS&CC) can be attempted using a CD of storm noises. Start with the least scary stimulus (from the individual dog’s perspective), such as rain. Begin each stimulus softly, with a gradual increase in volume. Move slowly and gradually to sounds, such as thunder, that trigger more intense fear. Sessions should take place daily for 5 to 10 minutes, or as the owner’s schedule permits. The goal is to keep the dog calm and relaxed during the session. However, the CD should NOT be played as background noise, playing loudly, because this may worsen the anxiety due to the “flooding” effect or technique (see Flooding: Can It Drown Fears). While DS&CC can be used for other noises, such as fireworks, it is often ineffective for treatment of storm phobia because sound alone cannot recreate the weather event completely. Classical conditioning (CC) can work very well. With CC, the fear-triggering stimulus (dark sky, rain, thunder) is paired with a favorite treat and/or toy—whether or not the pet is entirely relaxed. This creates a positive association, such as dark sky = cheese or thunder = hot dogs. These “storm parties” allow the pet to look forward to something very special when the stimulus develops rather than reacting in fear. Ideally, CC should begin when the dog is a puppy, learning at a young age that the outcome of the storm is something positive. Anxiety stems from uncertainty—by ensuring the outcome early on, the puppy will learn to expect food, a special toy, or other positive item or experience during a storm, with no reason to expect frightening stimuli. Under NO circumstances should punishment be used when an owner is helping his or her dog overcome noise or storm phobias, especially if there has been physical damage that occurred while the owner was away. Punishment only serves to increase the pet’s anxiety and fear. Make the owner aware that keeping the pet calm and relaxed is a requisite part of treatment. Some dogs respond well to the various capes and wraps available, including the Storm Defender Cape (stormdefender.com), Anxiety Wrap (anxietywrap.com), and Thundershirt (thundershirt.com). Since many owners are at work when storms hit, it is my experience that such capes/wraps can be left on during the day—indoors—without negative effects. Figure. Benny the dog is relaxing in a Storm Defender Cape rather than hiding in the closet during thunder storms. Spray for use on bedding and other surfaces, but NOT on the dog. The diffuser and collar are effective for 3 to 4 weeks and should be used for the duration of storm season for maximum response. Treatment can be instituted approximately a month before “storm season” and, if appropriate, the dog may be slowly weaned off the medication after the season is over. For panic that many dogs experience during storms, a fast-acting benzodiazepine (ie, alprazolam, diazepam, lorazepam, clonazepam) can be given 30 to 60 minutes before the storm starts. Since owners cannot always be present during a storm, the benzodiazepine can be administered prior to the owner leaving the home if a storm is predicted. Additional doses can be administered as needed. If the storm-phobic dog is an “only” dog or can be isolated from housemates, owners can provide a midday dose of the benzodiazepine within a “meatball” inside an automatic feeder—set to open in time to address any afternoon storms. Trazodone, a serotonin antagonist reuptake inhibitor, can be effective used alone or in combination with either a SSRI, TCA, or benzodiazepine.12 Combination therapy between trazodone and a SSRI or TCA must be monitored carefully for serotonin syndrome, an unlikely (at recommended doses) but serious complication. Crowell-Davis SL, Murray T. Veterinary Psychopharmacology. Ames, IA: Blackwell Publishing, 2006. Horwitz DF, Neilson JC. Generalized anxiety. Blackwell’s Five-Minute Veterinary Consult Clinical Companion Canine & Feline Behavior. Ames, IA: Blackwell Publishing, 2007, pp 310-319. While noise and storm phobias are common, they can be challenging to treat. It is best to address these cases using a multimodal approach, realizing that no one treatment will work every time in every dog. Levine ED. Feline fear and anxiety. Vet Clin N Am Small Anim Pract 2008; 38(5):1065-1067. Sapolsky RM. Ulcers, the runs, and hot fudge Sundays. Why Zebras Don’t Get Ulcers, 4th ed. New York: Henry Holt & Co, 2004, pp 19-36. The American Heritage Dictionary of the English Language, 5th ed. Boston: Houghton Mifflin Company, 2006. Random House Webster’s Unabridged Dictionary, 2nd ed. New York: Random House, LLC, 2005. Beaver BV. Canine Behavior: A Guide for Veterinarians. Philadelphia: WB Saunders, 1999, p 85. Blackwell E, Casey R, Bradshaw J. Firework Fears and Phobias in the Domestic Dog – Scientific Report for the RSPCA. Published in 2005 and available at rspca.com. Dreschel NA, Granger DA. Physiological and behavioral reactivity to stress in thunderstorm-phobic dogs and their caregivers. Appl Anim Behav Sci 2005; 95(3):153-168. Landsberg GM. Treatment of behavioral problems. The Merck Veterinary Manual. Whitehouse Station, NJ: Merck Sharp & Dohme Corp, 2010-2013, online. Cottam N, Dodman N. Comparison of the effectiveness of a purported anti-static cape (the Storm Defender) vs. a placebo cape in the treatment of canine thunderstorm phobia as assessed by owners’ reports. Appl Anim Behav Sci 2009; 119(1-2):78-84. Cottam N, Dodman N. The effectiveness of the Anxiety Wrap in the treatment of canine thunderstorm phobia: An open-label trial. J Vet Behav 2013; 8(3):154-161. Levine ED, Ramos D, Mills DS. A prospective study of two self-help CD based desensitization and counter-conditioning programmes with the use of dog appeasing pheromone (D.A.P.) for the treatment of firework fears in dogs (Canis familiaris). Appl Anim Behav Sci 2007; 105(4):311-329. Gruen ME, Sherman BL. Use of trazodone as an adjunctive agent in the treatment of canine anxiety disorders: 56 cases (1995-2007). JAVMA 2008; 233(12):1902-1906. DePorter TL, Landsberg GM. Harmonease Chewable Tablets reduces noise-induced fear and anxiety in a laboratory canine thunderstorm simulation: A blinded and placebo-controlled study. J Vet Behav 2012; 7(4):225-232. Terry Marie Curtis, DVM, MS, Diplomate ACVB, is head of the Clinical Behavior Service at the University of Florida College of Veterinary Medicine and also makes house calls in Florida and South Georgia for behavior-related cases. She is the author of a number of peer-reviewed articles, including book chapters in Veterinary Clinics of North America and Blackwell’s Five-Minute Veterinary Consult (5th ed). She regularly lectures at the NAVC Conference, coordinates its day-long behavior symposium, and has appeared on ABC’s Nightline and NBC’s Today Show. She received her DVM from University of Florida and completed her veterinary behavior residency and MS in psychology at University of Georgia.